Our sales reports track all your sales data from day one on Amazon's marketplace. With over 20 years' experience in manufacturing, combined with 10+ years' Amazon experience, we can identify the right numbers you need to run your business. Our reporting services enable you to access sales analyses, promotional results and online content status anytime, from anywhere in the world. All our analyses and graphs can be exported into your presentations with a single click, allowing you to be prepared for any meeting. Our sales reports track all your sales data from the moment you start on Amazon. Use the overview to visualise sales trends and key figures over selected time periods, by country or aggregated across all Amazon platforms. Use the Buy Box Analysis to identify where you are losing revenue due to pricing or availability issues. Use the YoY Comparison to check if certain categories are over- or under-performing. Get a full historical analysis of your Amazon sales performance with just a few clicks! AMS campaigns need a deep level of analysis to be well optimised. 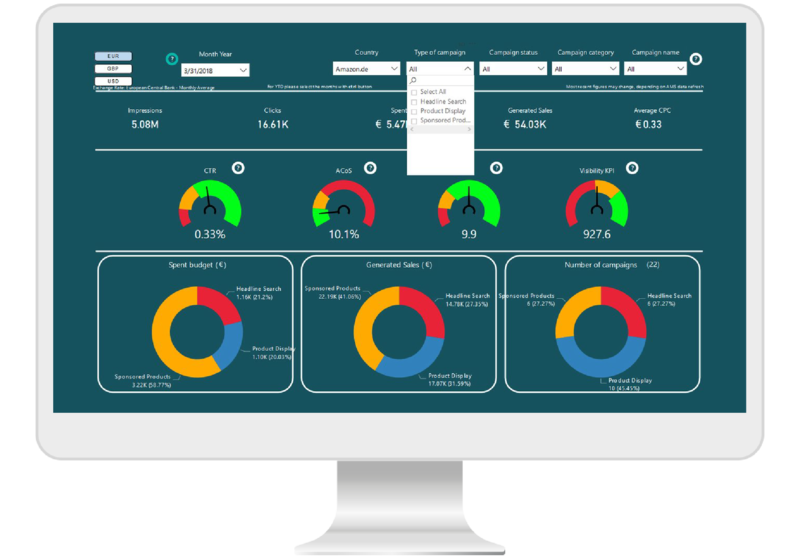 The AMS & Promotions Dashboard allows you to analyse all your campaigns with various filters: by country, campaign type, product category etc. 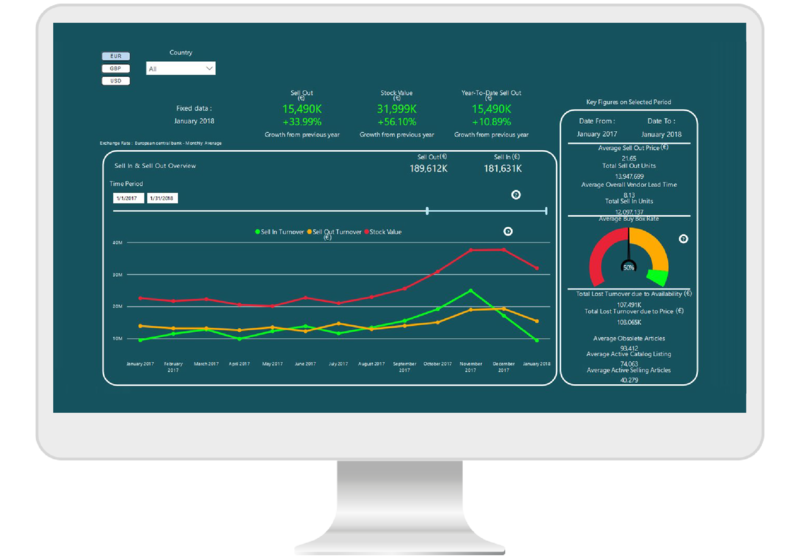 It offers dashboards you can share with decision makers, showing budget spent, sales generated, impressions, clicks performance, and other KPIs. Have you ever wondered how a single product was performing over the years? 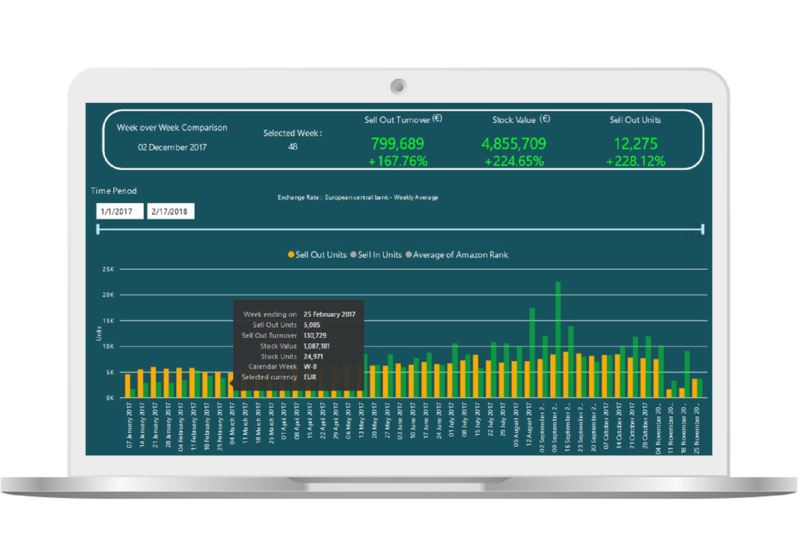 With our cloud-based reporting tool, you can now track ASIN-level performance: sales, stock, and weekly and yearly evolution. We highlight your weekly winners and losers to identify potential issues and address them quickly. Check the quality of your content on Amazon. Is your content still online, or have marketplace sellers taken over? How many products are in your active catalogue, and how many photos do they have? Are all your A+ pages well presented? How many products have no A+ content?